PHUKET: The Phuket Provincial Public Health Office (PPHO) yesterday launched a series of raids on major retailers selling New Year gift baskets to ensure that they do not contain alcoholic beverages. 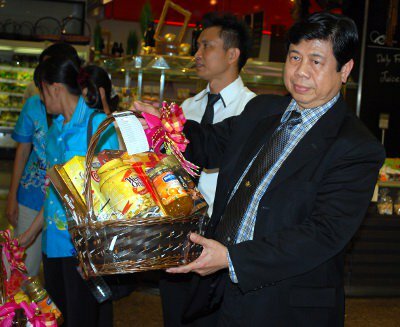 “I have informed all major retailers that New Year gift baskets may not contain alcohol,” said PPHO chief Dr Sak Tanchaikul. “The PPHO have right to report to the police any store violating the law. If found guilty they face a fine of up to 10,000 baht and/or six months imprisonment,” warned. Dr Sak explained that the inclusion of alcohol in gift baskets is considered illegal by the Health Ministry under Section 30 (5) of the Alcohol Control Act 2009. He and a team of health officials yesterday inspected gift baskets on sale at Tops supermarket at Central Festival Phuket on the bypass road. “We found that Tops supermarket had followed the law and had not included alcoholic beverages in their baskets. “Furthermore, the items they had packed displayed clear labeling stating, in both Thai and English, the manufacture and expiry dates of the foodstuffs [included in the gift baskets],” said Dr Sak. However, not all shops visited by health officials had been as diligent in adhering to the regulations. “Today, health officers inspected 2,869 baskets in stores around Phuket. Of them, 401 did not meet the required standards. The reason in many cases being unclear expiry dates or damaged food cans,” said Dr Sak. “As this was only the first day of inspections, we issued warnings and recommended that they improve the quality of the products in the baskets. We will revisit these stores and carry out follow-up inspections. If they haven’t heeded our advice we’ll file a [police] complaint against them,” he added. Tops Supermarket confirmed gift baskets sold well during the New Year holiday season. “Gift baskets are one of our best selling products, at least 100 baskets per day. We offer many varieties of product, such as main food products, snacks and fruit juices, in our baskets,” said Panuwat Takod, branch manager of Tops Supermarket at Central Festival.